In the last 12 months, we’ve invested well over $1million in our machinery and now proudly house some of the most modern and capable textile print and cutting machinery available world-wide. These machines have been chosen for their award-winning quality and reliability and of course their outputs. We have the largest finishing team in the country running our state-of-the-art finishing equipment. 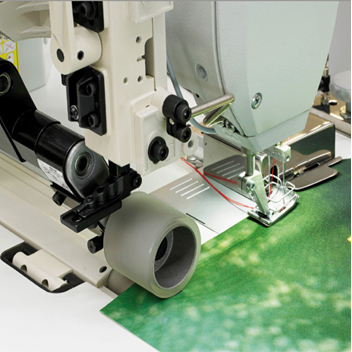 We boast a suite of finishing machines, including fully automated sewing machines through to more manual specialised equipment, to allow us to service our client’s needs in the dye-sublimated graphic production. This choice allows us to ensure the highest quality and flexible solutions when finishing and manipulating the dye-sublimated textile imagery. Across our finishing team and machinery we are able to collectively sew 238 lineal meters per hour in house. The skillset within the finishing team has been built up around our customer’s requirements and ranges from standard product with astronomical quantities through to small run bespoke items that are manufactured under contract. 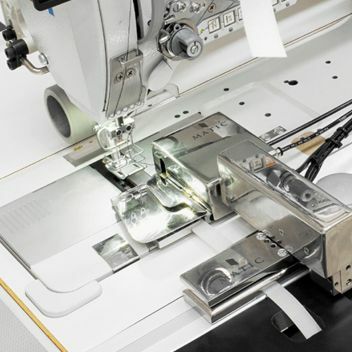 We use our machines to ensure that we achieve consistency within our finishing and to achieve undeviating high-quality flat seams, curved seams and correct positioning. This reduces production time so our finishing team can spend more time on working on collaborated bespoke projects where more smarts are needed.